ALEXI LAIHO – Lick This! Posted in: On The Inside. Tagged: Alexi Laiho, Children Of Bodom, ESP guitars, Janne Wirman, Kylähullut, Rock House DVD, Roope Latvala. 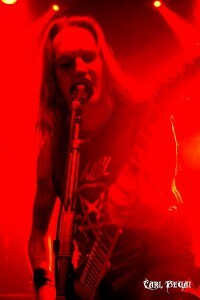 For starters, Laiho’s gives axe-slinging partner in crime Roope Latvala his due. He makes it clear Latvala is an integral part of Children Of Bodom even though he’s often overshadowed – in the press, at any rate – by Laiho and keyboardist Janne Wirman. Nobody should underestimate Latvala’s contributions to the Bodom soundtrack, because even though Laiho plays musical director, he isn’t about to start ordering around the former guitarist of the legendary Stone, a band he idolized. In recent years Laiho used some of his rare downtime to film instructional DVD material for Rock House. Basically, a Shred-Like-Laiho video handbook for the serious musician.